SpaceX launched 20th rocket of the year on Wednesday barely two days after its record-breaking act of lifting off 64 satellites into the orbit. That record-breaking act was smooth like hell as everything went as planned. However, today’s launch didn’t quite prove to be a smooth affair for the Elon Musk’s space company. 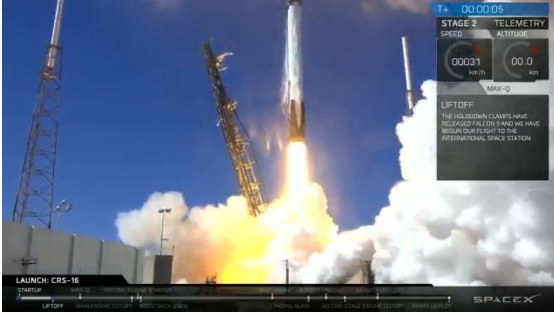 On Wednesday afternoon, unmanned SpaceX Falcon 9 successfully lifted off at approximately 1:16 P.M for the international space station. After the lift-off, everything went as per the plan including the crucial part where it effectively propelled the cargo-laden Dragon capsule towards the international space station. However, as soon as this crucial part was phased out, Falcon’s first stage (most expensive portion of the rocket) that was supposed to navigate itself back to the earth malfunctioned. Instead of landing at SpaceX’s designated landing pad, it ended up submerging in the Atlantic Ocean – just off the Florida coast. SpaceX’s special team will have to investigate into issue to find out what really caused this minor yet embarrassing glitch. But then we can always wait for Musk to come up with his own theory. Below is the screenshot of Musk’s tweet that was tweeted shortly after the incident. SpaceX’s Vice President Hans Koenigsmann also conducted a press conference after the incident. Hans claimed that the water landing was pretty much smooth and today’s incident showed how SpaceX’s rocket are designed to save itself in case if anything goes wrong. Today’s incident marks the first time the Falcon has failed to land at designated spot (solid ground) ever since SpaceX began recovering boosters.